Fourteen-year-old Angel Yin of Arcadia, Calif. fired a 5-under par 67 Tuesday on the Arnold Palmer Course at Mission Hills CC to win the 2013 Kraft Nabisco Legends Junior Challenge. The event teamed 30 of Southern California's top female junior golfers with LPGA legends for an inspirational round of golf. 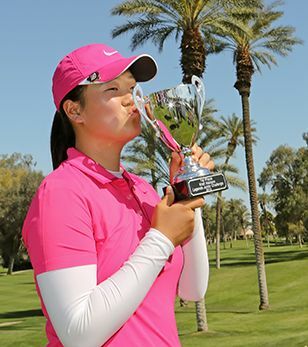 With the win, Yin was awarded the final playing spot in this week's Kraft Nabisco Championship. "I'm very excited, this is pretty cool," said Yin. "It's one of my favorite tournaments to watch because the winner gets to jump in the pond at the end. I just want to get out there and have fun and experience what it's like for LPGA players." Yin, who was the second-youngest player in the field, proved experience doesn't always matter, carding seven birdies en route to her 5-under par round. She was coached by World Golf Hall of Fame Member Donna Caponi, who was participating in the event for the second-straight year. "Angel was beyond impressive out there today," said Caponi. "When I was 14 I could barely dress myself, let alone go out there and play golf like she can." Caponi's knowledge of the course proved helpful for Yin, who turned to her coach, who is a Mission Hills CC member, multiple times during the round for advice. Caponi helped Yin read the greens on multiple occasions, and also talked with her about what type of approach to take on certain shots. "Without Donna I would have missed a few of those putts, so I definitely need to thank her," said Yin. "I was kind of nervous, playing with a legend walking next to me, but I got to ask her about her career and she taught me a lot just by telling me about her own professional experiences." Caponi captained a team of Yin, Angella Then and Megan Kim, who combined for a team-score of 10-under par to capture the win in the team portion of the event as well. A $10,000 donation to the Susan G. Komen Foundation, the charity of Caponi's choice, was made in their honor. "My mother passed away from breast cancer so it's really special for me to get to help such a wonderful cause," said Caponi. The 30 girls were selected to participate in the event by a committee led by SCGA Youth on Course, the charitable arm of the Southern California Golf Association. The juniors were chosen based on their golf resumes, community involvement and leadership activities. SCGA Youth on Course, which also provided tournament support for the event, was awarded a $10,000 grant for its involvement.